Project Control Checklist is created to support the project managers in their efforts at controlling projects for making sure that working activities are going according to appropriate plans. By aid of this checklist you can control projects in terms of their progress, results, objectives and quality. Use routine reporting to identify what has been done so far and what has not. Use Earned Value Analysis to compare the value created against funds spent up to a moment. Make sure all changes are implemented via applicable change management procedures to avoid uncontrolled project creep that might collapse the project. Adjust project deviations early, but align your response with the project tolerance parameters to avoid overcontrol issue. The progress is assessed by the achievement (or not) of specific objectives. Continually address the project tolerance measures to prevent low-value polishing. Use applicable procedures of customer acceptance where needed or possible. 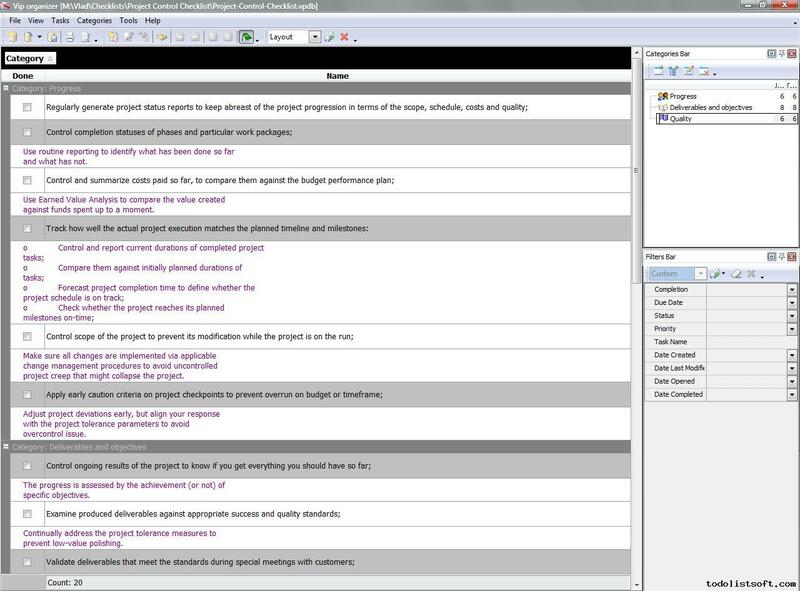 Use checklists to cross out the deliverables which have been already properly completed. Make sure that assumptions and needs underlying the project are still relevant. Use checklists to control step-by-step attainment of goals to learn if the overall direction of the project is still in line with the purposes of the project. If the deliverable satisfies the need and date it has been expected to then an objective has been completed successfully. Continually make sure the quality management plan is known by the staff and working well. Remember that quality should be continually planned and realized as an embedded feature. Accurate predictive quality controls enable detecting and rectifying issues early. Reason any deviations as ones which are not critical (tolerated) and those which need a redo.